The American Film Institute (AFI) in Los Angeles, California conducted their eighth polling, 100 Years...100 Movie Quotes highlighting "America's Greatest Quotes in the Movies." 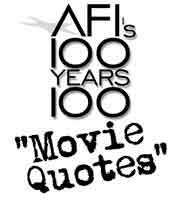 AFI's 100 Years... 100 Movie Quotes revealed the 100 Greatest Movie Quotes in American films, as chosen by leaders of the entertainment community, in a three-hour television event, that aired on the CBS Television Network in June 2005. A ballot was distributed in 2004 with 400 Nominated Quotes from Films to a jury of 1,500 leaders from the film community, including filmmakers, actors, historians, scholars, journalists and industry types. Voters could submit up to five write-in choices not included among the 400 nominees. See also the Top 10 Most Famous Movie Quotes according to the Guinness Book of Film, and the Top 10 Best Movie Lines Ever according to Odeon Cinemas, and the Top 10 Best Comedy Lines From Classic Films according to TCM. 1. RHETT BUTLER (Clark Gable): "Frankly, my dear, I don't give a damn." 2. VITO CORLEONE (Marlon Brando): "I'm going to make him an offer he can't refuse." 3. TERRY MALLOY (Marlon Brando): "You don't understand! I could've had class. I could've been a contender. I could've been somebody, instead of a bum, which is what I am." 4. DOROTHY GALE (Judy Garland): "Toto, I've (got) a feeling we're not in Kansas anymore." 5. RICK BLAINE (Humphrey Bogart): "Here's looking at you, kid." 6. HARRY CALLAHAN (Clint Eastwood): "Go ahead, make my day." 7. NORMA DESMOND (Gloria Swanson): "All right, Mr. DeMille, I'm ready for my close-up." 8. HAN SOLO (Harrison Ford): "May the Force be with you." 9. MARGO CHANNING (Bette Davis): "Fasten your seatbelts. It's going to be a bumpy night." 10. TRAVIS BICKLE (Robert DeNiro): "You talkin' to me?" 11. CAPTAIN (Strother Martin): "What we've got here is failure to communicate." 12. LT. COL. BILL KILGORE (Robert Duvall): "I love the smell of napalm in the morning." 13. OLIVER BARRETT IV (Ryan O'Neal): "Love means never having to say you're sorry." 14. SAM SPADE (Humphrey Bogart): "(What is it?)" "The stuff that dreams are made of." 15. E.T. (voice of Joe Welsh): "E.T. phone home." 16. VIRGIL TIBBS (Sidney Poitier): "They call me Mister Tibbs!" 17. CHARLES FOSTER KANE (Orson Welles): "Rosebud." 18. ARTHUR 'CODY' JARRETT (James Cagney): "Made it, Ma! Top of the world!" 19. HOWARD BEALE (Peter Finch): "I'm as mad as hell, and I'm not going to take this anymore! 20. RICK BLAINE (Humphrey Bogart): "Louis, I think this is the beginning of a beautiful friendship." 21. DR. HANNIBAL LECTER (Anthony Hopkins): "A census taker once tried to test me. I ate his liver with some fava beans and a nice chianti." 22. JAMES BOND (Sean Connery): "Bond. James Bond." 23. DOROTHY GALE (Judy Garland): "There's no place like home." 24. NORMA DESMOND (Gloria Swanson): "I am big! It's the pictures that got small." 26. LADY LOU (Mae West): "Why don't you come up sometime and see me?" 27. 'RATSO' RIZZO (Dustin Hoffman): "(Hey!) I'm walking here! I'm walking here!" 28. ILSA LASZLO (Ingrid Bergman): "Play it, Sam. Play 'As Time Goes By.'" 29. COL. NATHAN JESSEP (Jack Nicholson): "You can't handle the truth!" 30. GRUSINSKAYA (Greta Garbo): "I want to be alone." 31. SCARLETT O'HARA (Vivien Leigh): "After all, tomorrow is another day!" 32. CAPT. RENAULT (Claude Rains): "Round up the usual suspects." 33. CUSTOMER (Estelle Reiner): "I'll have what she's having." 34. MARIE 'SLIM' BROWNING (Lauren Bacall): "You know how to whistle, don't you, Steve? You just put your lips together and blow." 35. MARTIN BRODY (Roy Scheider): "You're gonna need a bigger boat." 36. GOLD HAT (Alfonso Bedoya): "Badges? We ain't got no badges! We don't need no badges! I don't have to show you any stinking badges!" 37. THE TERMINATOR (Arnold Schwarzenegger): "I'll be back." 38. LOU GEHRIG (Gary Cooper): "Today, I consider myself the luckiest man on the face of the earth." 39. SHOELESS JOE JACKSON (voice of Ray Liotta): "If you build it, he will come." 40. FORREST GUMP (Tom Hanks): "My mama always said, 'Life is (was) like a box of chocolates. You never know what you're gonna get.'" 41. CLYDE BARROW (Warren Beatty): "We rob banks." 42. MR. MAGUIRE (Walter Brooke): "Plastics." 43. RICK BLAINE (Humphrey Bogart): "We'll always have Paris." 44. COLE SEAR (Haley Joel Osment): "I see dead people." 45. STANLEY KOWALSKI (Marlon Brando): "Stella! Hey, Stella!" 46. CHARLOTTE VALE (Bette Davis): "Oh, Jerry, don't let's ask for the moon. We have the stars." 47. JOEY STARRETT (Brandon DeWilde): "Shane! Shane! Come back!" 48. OSGOOD FIELDING III (Joe E. Brown): "Well, nobody's perfect." 49. HENRY FRANKENSTEIN (Colin Clive): "It's alive! It's alive!" 50. JIM LOVELL (Tom Hanks): "Houston, we have a problem." 51. HARRY CALLAHAN (Clint Eastwood): "You've got to ask yourself one question: 'Do I feel lucky?' Well, do ya, punk?" 52. DOROTHY BOYD (Renee Zellweger): "You had me at 'hello.'" 53. CAPT. JEFFREY T. SPAULDING (Groucho Marx): "One morning I shot an elephant in my pajamas. How he got in my pajamas, I don't know." 54. JIMMY DUGAN (Tom Hanks): "There's no crying in baseball!" 55. ANNIE HALL (Diane Keaton): "La-dee-da, la-dee-da." 56. NORMAN BATES (Anthony Perkins): "(Well), A boy's best friend is his mother." 57. GORDON GEKKO (Michael Douglas): "Greed, for lack of a better word, is good." 58. MICHAEL CORLEONE (Al Pacino): "Keep your friends close, but your enemies closer." 59. SCARLETT O'HARA (Vivien Leigh): "As God is my witness, I'll never be hungry again." 60. OLIVER (Oliver Hardy): "Well, here's another nice mess you've gotten me into!" 61. TONY MONTANA (Al Pacino): "Say 'hello' to my little friend!" 62. ROSA MOLINE (Bette Davis): "What a dump." 63. BENJAMIN BRADDOCK (Dustin Hoffman): "Mrs. Robinson, you're trying to seduce me. Aren't you?" 64. PRESIDENT MERKIN MUFFLEY (Peter Sellers): "Gentlemen, you can't fight in here! This is the War Room!" 65. SHERLOCK HOLMES (Basil Rathbone): "Elementary, my dear Watson." 66. GEORGE TAYLOR (Charlton Heston): "Get your stinking paws off me, you damned dirty ape!" 67. RICK BLAINE (Humphrey Bogart): "Of all the gin joints in all the towns in all the world, she walks into mine." 68. JACK TORRANCE (Jack Nicholson): "Here's Johnny!" 69. CAROL ANNE FREELING (Heather O'Rourke): "They're here!" 70. DR. CHRISTIAN SZELL (Laurence Olivier): "Is it safe?" 71. JAKIE RABINOWITZ/JACK ROBIN (Al Jolson): "Wait a minute, wait a minute. You ain't heard nothin' yet!" 72. JOAN CRAWFORD (Faye Dunaway): "No wire hangers, ever!" 73. CESARE ENRICO 'RICO' BANDELLO (Edward G. Robinson): "Mother of mercy, is this the end of Rico?" 74. WALSH (Joe Mantell): "Forget it, Jake. It's Chinatown." 75. BLANCHE DUBOIS (Vivien Leigh): "I have always depended on the kindness of strangers." 76. THE TERMINATOR (Arnold Schwarzenegger): "Hasta la vista, baby." 77. DET. ROBERT THORN (Charlton Heston): "Soylent Green is people!" 78. DAVE BOWMAN (Keir Dullea): "Open the pod bay doors, (please) HAL." 79. TED STRIKER (Robert Hays): "Surely you can't be serious." DR. RUMACK (Leslie Nielsen): "I am serious. And don't call me Shirley." 80. ROCKY BALBOA (Sylvester Stallone): "Yo, Adrian!" 81. FANNY BRICE (Barbra Streisand): "Hello, gorgeous." 82. JOHN 'BLUTO' BLUTARSKY (John Belushi): "Toga! Toga!" 83. COUNT DRACULA (Bela Lugosi): "Listen to them. Children of the night. What music they make." 84. CARL DENHAM (Robert Armstrong): "Oh, no, it wasn't the airplanes. It was Beauty killed the Beast." 85. GOLLUM (Andy Serkis): "My precious." 86. SONNY WORTZIK (Al Pacino): "Attica! Attica!" 87. JULIAN MARSH (Warner Baxter): "Sawyer, you're going out a youngster, but you've got to come back a star!" 88. ETHEL THAYER (Katharine Hepburn): "Listen to me, mister. You're my knight in shining armor. Don't you forget it. You're going to get back on that horse, and I'm going to be right behind you, holding on tight, and away we're gonna go, go, go!" 89. KNUTE ROCKNE (Pat O'Brien): "Tell 'em to go out there with all they got and win just one for the Gipper." 90. JAMES BOND (Sean Connery): "A martini. Shaken, not stirred." 91. DEXTER (Bud Abbott): "Who's on first." 92. CARL SPACKLER (Bill Murray): "Cinderella story. Outta nowhere. A former greenskeeper, now, about to become the Masters champion. It looks like a mirac... It's in the hole! It's in the hole! It's in the hole!" 93. MAME DENNIS (Rosalind Russell): "Life is a banquet, and most poor suckers are starving to death!" 94. LT. PETE 'MAVERICK' MITCHELL (Tom Cruise): "I feel the need..."
LT. PETE 'MAVERICK' MITCHELL/ LT. NICK 'GOOSE' BRADSHAW (Anthony Edwards): "...the need for speed!" 95. JOHN KEATING (Robin Williams): "Carpe diem. Seize the day, boys. Make your lives extraordinary." 96. LORETTA CASTORINI (Cher): "Snap out of it!" 97. GEORGE M. COHAN (James Cagney): "(Ladies and Gentlemen), My mother thanks you. My father thanks you. My sister thanks you. And I thank you." 98. JOHNNY CASTLE (Patrick Swayze): "Nobody puts Baby in a corner." 99. THE WICKED WITCH OF THE WEST (Margaret Hamilton): "I'll get you, my pretty, and your little dog, too!" 100. JACK DAWSON (Leonardo DiCaprio): "I'm (the) king of the world!" - "Surely, you can't be serious." "My mama always said, 'Life is (was) like a box of chocolates. You never know what you're gonna get'." "(What is it?)" "The, uh, stuff that dreams are made of." "My mama always said, 'Life was like a box of chocolates. You never know what you're gonna get'." "Say 'hello' to my little friend." "Oh, Jerry, don't let's ask for the moon. We have the stars." "As God is my witness, I'll never be hungry again." "Take your stinkin' paws off me, you damned dirty ape!" "Today, I consider myself the luckiest man on the face of the earth." (# 50) from Apollo 13 (1995) - The real historical quote was: "Houston, we've had a problem." "Tell 'em to go out there with all they got, and win just one for The Gipper." "My mother thanks you. My father thanks you. My sister thanks you. And I thank you." Silent films were ignored, although there could be some inter-titles that were worthy of choice. Short, simple catchphrases, one-word quotes (often repeated), and quips were over-emphasized, rather than actual monologues/speeches, words of true wit, or conversational dialogues.